Maria Villanueva Mora obituary. Carnes Funeral Home. 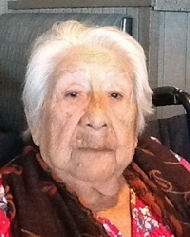 Maria V. Mora was born in Monte Morelos, NL Mexico on January 2nd, 1918. She passed away on Monday, March 2nd, 2015 at her residence in Houston, Texas surrounded by her loving family. Ms. Mora worked hard all her life to educate and bring up her eight children. She was a loving mother, grandmother, great-grandmother and great-great grandmother. Maria was well loved by all who knew her. She was an avid gardener and pet lover. She will be greatly missed by all who love her. She is survived by Martha M. Sandoval (Julian Sandoval, Sr.) of Alamo, Texas, Jesus Mora (Patricia Campos Mora), Jose Alfredo Mora (Irene Mora), San Juana M. Rogers (Anthony Rogers), Maria Mora, all of Houston, Texas, Margarita Mora of Pharr, Texas and Carlos Mora (Peggy Mora) of Houston, Texas. She also leaves behind eighteen grandchildren, forty-five great-grandchildren and thirty great-great grandchildren to cherish her memory. Serving as pallbearers will be Julian Sandoval, Jr., Nicolas Rogers, Neal Mora, Kalani Jaime, Diego Guerrero and Patrick C. Webber. Guests are invited to share in the Celebration of Life Visitation for Mrs. Maria Villanueva Mora from 9:00 - 10:30 a.m., with the Funeral Mass to follow on Friday, March 6th, 2015 at St. Patrick Catholic Church, 4918 Cochran Street, Houston, Texas 77009. Interment will follow at Hollywood Cemetery, 3506 N. Main Street, Houston, Texas 77009.